The Holt family business tradition goes back to the mid-1880’s in California when Benjamin Holt produced his first horse-drawn “Link-Belt Combined Harvester,” starting a tradition of invention and innovation that has endured for generations. Later, Holt produced some of the earliest steam traction engines and also charted a new direction – an unheard of level of customer service for Holt Manufacturing Company, an emphasis still at HOLT CAT® today, which utilizes a values-based leadership process. As Holt's early tractors grew larger and more unwieldy, their giant wheels bogged down in the farmlands, encouraging the development of the pioneering Holt track-type model. Finding that heavy farm equipment bogged down in the loose soil of the San Joaquin River Delta, Holt put his inventive mind to work again, using self-laying tracks instead of wheels on his new invention. In late 1904, the first successful track-type tractor, the “Caterpillar®,” crawled across a California wheat field, making history every foot of the way. 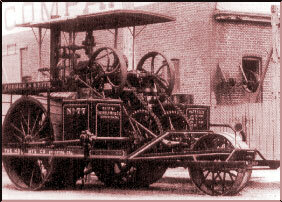 Its commercial success was assured once Holt found a way to power it with a gasoline engine in 1908. As the company grew, Holt moved the tractor manufacturing operations to a more central location in Peoria, Illinois, where Caterpillar Inc. is still headquartered. The impact of the Caterpillar tractor went far beyond agriculture. In World War I, it fought the mud of the Western front, towing equipment for the Allied military forces and was the inspiration for the development of the British tank, which profoundly altered ground warfare tactics. The Original Caterpillar Tractor - By 1906, Holt tracks had proven so effective in plowing marshy delta lands that wheels had become a thing of the past. Holt machines developed an international reputation. The first Holt logo used in a 1912 sales brochure commemorated the company's 1883 manufacturing origin. In 1925, Holt Manufacturing Company merged with one of its longtime competitors, Best Tractor Company, to form Caterpillar Tractor Co., consolidating the dealerships of both companies into a network of strong, independent Caterpillar dealerships known for their responsive service. One of Holt’s sons, William K. “Bill” Holt, established the first Caterpillar dealership in Mexico in the mid-1920s, initiating what would be a long-standing business relationship between the Holt Companies and Mexico which continues successfully today. In 1933, Bill Holt was authorized to operate the dealership for the 60 southern counties of Texas. Holt’s inventiveness continued to flourish in Texas. Seeing the need for specialized land-clearing equipment, Bill Holt encouraged the development of the Holt root plow during the 1940s. After developing the root plow, in quick succession he developed Holt root rakes and other brush management implements. Today, the Holt land-clearing equipment is sold all over the world, a tribute to the second generation of Holt ingenuity. The innovative design of Holt combines replaced costly gearing with "link belt" chains that transmitted power from the wheel to the combine's working parts. In the 1950’s, Bill Holt brought two of his nephews into the dealership – B.D. Holt and Holt Atherton. In 1961, B.D. Holt purchased Bill Holt’s assets in the 20 southern counties of the William K. Holt territory and established B.D. Holt Co. as a Caterpillar dealer with headquarters in Corpus Christi. His years of leadership resulted in successful diversification and further growth for the company including the vision to invest in packaging gas compression equipment for the petroleum marketplace. In 1969, B.D. Holt and his partner Mark Hulings formed Energy Industries, Inc. to manufacture and market gas compressors powered by Caterpillar engines. Energy Industries enjoyed tremendous success and as part of the Holt Companies’ business strategy, it was sold in 1993. In 1963, Holt Atherton purchased Bill Holt’s assets in the northern 40 counties of the William K. Holt territory and established Holt Machinery Co. with its headquarters in San Antonio. In 1972 he built a modern, new branch store to serve the Austin market. Manufacturing facilities for land clearing equipment and water wagons were greatly expanded in 1975 and in 1978 a branch store was established in Laredo to service that area. 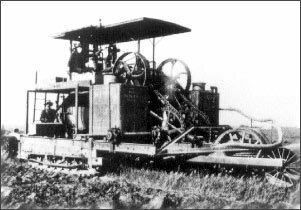 This 1908 model of the Holt steam-powered crawler proved highly effective in the project to build the Los Angeles, California, Aqueduct. Holt then moved to another innovation - powering his tractor with a gasoline engine. Peter M. Holt, B.D. Holt’s son, joined the B.D. Holt Co. in 1973, later becoming Chief Executive Officer of the Holt Companies and pushing forward with a diversification program. In 1985, he was appointed as Caterpillar dealer for the western half of Ohio. This move enabled Holt to reduce its dependence on Texas’ natural resource-based economy. In 1987, B.D. Holt Co. acquired controlling interest in Holt Machinery Co. and merged the two territories of the original William K. Holt Machinery Co. to form Holt Company of Texas. As the Holt Companies expanded, Peter M. Holt saw the need to develop a long-term vision and growth process. He wanted to reinforce the Holt tradition of quality products and service to customers, and he recognized the importance of involving the workforce in the progress and goals of the companies. The result was the creation of the Holt Companies mission statement and core business values in 1988, which serve as the centerpiece of a quality oriented, values-based management process called Values-Based Leadership®. Since the inception of Values-Based Leadership, the Holt Companies experienced significant growth in sales and profits, which has been accompanied by a spirit of shared responsibility, enhanced collaboration and a commitment to maintain the tradition of quality products and service for customers in a dynamic business environment. On April 1, 2002, Peter M. Holt, chief executive officer of Holt Company of Texas announced Holt’s purchase of certain assets of Dallas-based Darr Equipment Co. This purchase made the new company, HOLT CAT, one of the largest Caterpillar dealers in the world. The purchase of Darr’s Texas operation is consistent with Holt’s vision of stability and effective strategic growth. With this acquisition, HOLT CAT doubled in size, adding full-service stores in Fort Worth, Irving (Dallas), Longview, Texarkana, Tyler and Waco; Cat Rental Stores in Fort Worth, North Dallas and Waco; and specialty operations in Bridgeport and Irving.